I am a retired doctor who for many years has made slow and enjoyable progress through local evening classes and occasional courses. Now, with more time, the creative opportunities of stoneware are an absorbing passion. Slab,hand building, coil and the wheel are all being developed. 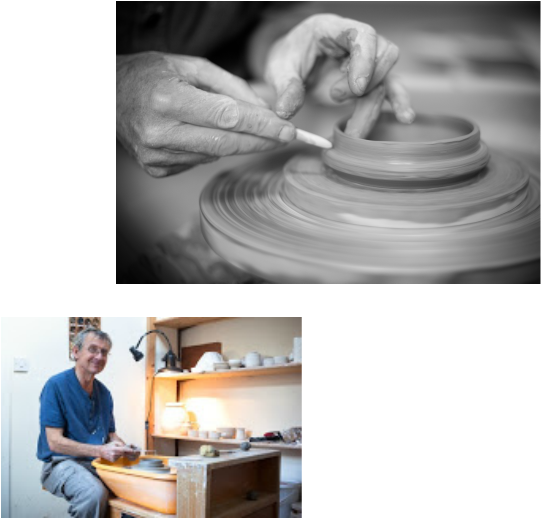 .Supporting small pottery classes through Bethany Christian Fellowship has added further interest, and I am always delighted for others to visit and join me in creative projects,or just for a coffee and chat. Most of my current work is functional and domestic and there is much pleasure in seeing a variety of pots in everyday use up and down the country. At times the hand building of, for example, hens ,fish and other wildlife add diversity and interest. Recently I have experimented with local clay from Glenbuchat, Strathdon and though time consuming the satisfaction of making a few unique terracotta pots has been well worth the effort. Commissions can be discussed -please let me know if any of my work is of particular interest. Visitors are always welcome. I now have a Facebook page entitled Beechgrove Pots -though intend keeping the website as my main "gallery". This year I will be participating in the Scottish Potters Association exhibition at the Milton Gallery , Banchory which runs from the 13th April to the 19th May 2019. This year ,though remaining a member of NEOS, I will not be participating as the dates present problems. However I will be joining other events through the year and am always happy to see visitors at the studio.